This stunning fireplace is sure to bring warmth and ambiance to any outdoor living area. This fireplace comes in a handsome antiqued black finish on the frame and a weathered copper finish on the chimney. The natural slate accents above and below the fire area tie together the contrasting hues of the copper and black to create a truly marvellous palette. Metal grating around the fire bowl keeps sparks and embers inside the fireplace during use. A large double door in the front provides easy access for tending the fire and adding logs. A stamped brick pattern behind the fireplace makes for a homey, cozy experience. The Insert is a freestanding fire feature that is designed for both indoor and outdoor use. It creates a large, soothing flame that allows you to convert your existing fireplace instantly. It is equipped with a flame regulation mechanism. This fireplace will burn for approximately 5 hours with 1 fill of superior quality bio ethanol fuel. Included in the box is an easy pour spout. This unit comes with a 3 Year Manufacturers Warranty. The Flamelux Electric Fireplace makes a large impact in any room. This Laminated Wood Fireplace for TVs will accommodate most flat panels up to 58"". The upper shelf is the perfect place for AV components and gaming consoles, while a pair of window-pane doors cover two storage areas, each with adjustable shelves. The mantel comes with a 23" Flamelux Electric Fireplace insert, , which can be used with or without heat for all season enjoyment. Designed for a traditional masonry fireplace, Pleasant Hearth Alpine Collection Glass Fireplace Doors have decorative cabinet styling and a one-piece welded frame with a high-heat, powder-coated black finish. Constructed for a surface mount, these doors sit outside the fireplace opening against a flat surface and help reduce heat or cool air loss up the chimney by as much as 90% for year-round energy savings. Made with clear tempered glass, these doors open completely so you can enjoy a full fireplace view and feature easy-catch magnets, easy-grip handles, thick heat-resistant insulation and hidden damper control knobs for airflow control. The premium mesh panels located behind the doors should always be closed and glass doors opened when you have a fire going. Simple to install in three easy steps, these fireplace doors add warmth, elegance and safety to your hearth and are fully assembled. Compatible with a traditional masonry fireplace, the decorative and bi-fold Pleasant Hearth Ascot Collection Glass Fireplace Doors have a 1-piece welded frame and a high-heat, powder-coated black finish. Designed as a surface mount, these track-free doors sit outside the fireplace opening against a flat surface and help reduce heat or cool air loss up the chimney by as much as 90% for year-round energy savings. Made of clear tempered glass, these doors have an easy-grip design, open 1800s so you can enjoy a full fireplace view and feature easy-catch magnets, easy-grip handles, thick heat-resistant insulation and hidden damper control knobs for airflow control. The mesh panels located behind the doors should always be closed and glass doors opened when you have a fire going. Simple to install in 3 easy steps, these fireplace doors are ideal for complementing any decor style and are fully assembled. Amherst Wood/Charcoal Outdoor Fireplace This stunning fireplace is sure to bring warmth and ambiance to any outdoor living area. This fireplace comes in a handsome antiqued black finish on the frame and a weathered copper finish on the chimney. The natural slate accents above and below the fire area tie together the contrasting hues of the copper and black to create a truly marvellous palette. Metal grating around the fire bowl keeps sparks and embers inside the fireplace during use. A large double door in the front provides easy access for tending the fire and adding logs. A stamped brick pattern behind the fireplace makes for a homey, cozy experience. Amherst Wood/Charcoal Outdoor Fireplace is rated 3.6 out of 5 by 16. Rated 5 out of 5 by Petra from Was a great purchase! Purchased mine in the summer 2014. It still works great and looks great! - I’ve sprayed mine with a clear heat resistant color (what you would normally use for motorcycles) prior to assemble. From that point on I always have a cover over it. So far no rust problems. Rated 2 out of 5 by Dave from Beautiful to look at but poorly serves its purpose....smoke pours out the sides and the at base o... Beautiful to look at but poorly serves its purpose....smoke pours out the sides and the at base of the chimmney vs actually have smoke exhaust from the top of chimmney, makes it unusable. Rated 3 out of 5 by tlc from We picked up this purchase in the store -- should have had them take the entire fireplace out of ... We picked up this purchase in the store -- should have had them take the entire fireplace out of the box (as the box was damaged on one side - our mistake). Took my husband less than an hour to put the entire piece together. Unfortunately, several of the "tiles" around the top were chipped on the corners :( Did not want to disassemble at that point to take back up to the store so we are just living with it. Overall we really enjoy this outdoor fireplace, but if the box is damaged take EVERY piece out to inspect - I wish we would have. Rated 4 out of 5 by T99 from Outdoor Fireplace Review Outdoor fireplace looks gorgeous on our back patio. Only complaint is the fireplace tool is cheap quality and came with a broken handle. 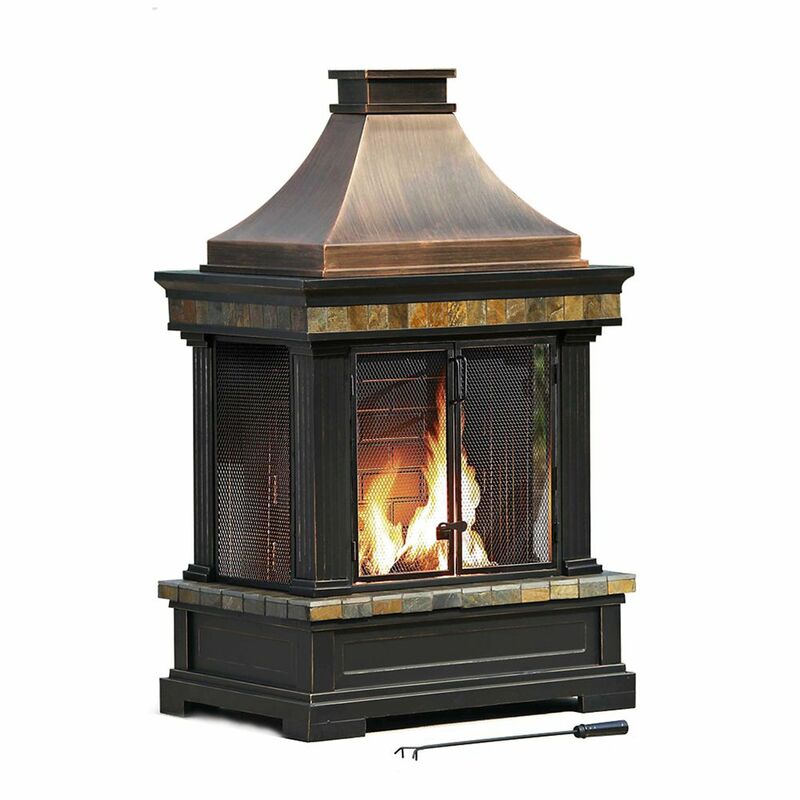 Rated 4 out of 5 by Coasty from Good Solution to an outdoor fireplace Item delivered to nearest store on time and in good shape. Assembly fairly easy. The fireplace functions great, most of the smoke up the chimney. Burns clean with seasoned wood. Unit is heavy enough so as not to worry about winds during our stormy season on the coast. We went through two clay chimeras which broke. One from too hot a fire and one that tipped and broke in the wind. This will solve that problem.